The "Shirt-Pocket" size FPM-250 incorporates a large area Indium Gallium Arsenide detector which provides much improved temperature stability at 1550 nm compared with the Germanium detectors used in many conventional instruments. This detector is able to deliver 15 to 20 dB greater sensitivity at the low end and better linearity at intermediate power levels. 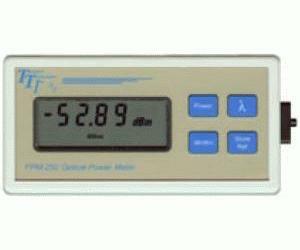 For higher power optical measurements such as those frequently required in the CATV industry, the FPM-250 with HP (high power) option permits measurements of up to 25 dBm.